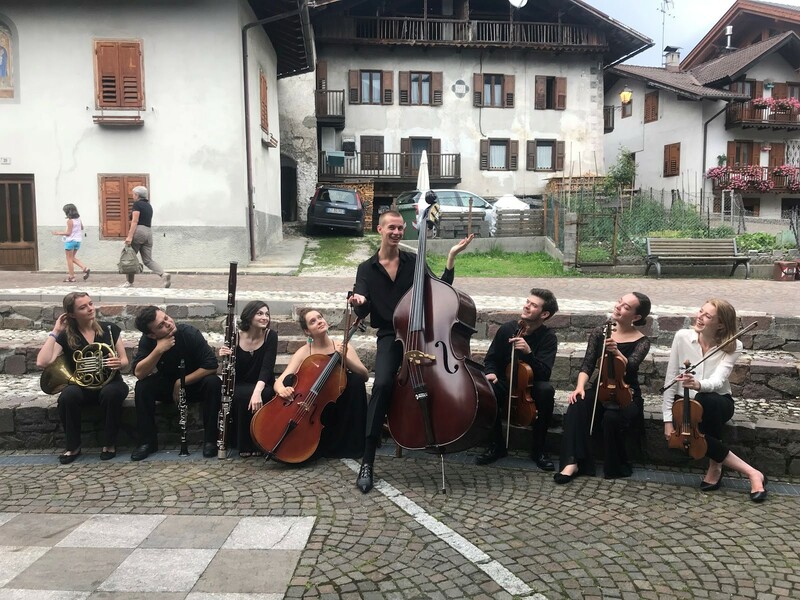 This summer I was given the unique opportunity of attending two classical music festivals in Europe – the Vienna Summer Music Festival and Music Academy International in Trentino, Italy. Going into this experience, I somewhat knew what to expect from Music Academy, as I had attended it the previous summer, but Vienna was completely new territory. As a major in instrumental music for violin performance, I think attending these kind of festivals, which combine orchestra, opera, and chamber playing experience all into one, are great preparation for a future career in music. With each of these festivals lasting about a month in duration, I was given two full sets of musical as well as interpersonal situations to navigate and work through over a period of time. The Vienna festival and its various rehearsal and performance locations were dispersed throughout the entire city. This meant each attendee became quite familiar with the public transportation system, mainly the U-Bahn subway system and S-Bahn train network. For example, I was given an address of where my private lesson was to be held, and was expected to go find it in a timely manner. Something unique to this festival was that we were able to perform Mozart’s opera, “The Magic Flute,” in the city in which he worked and lived! Take for example the day in which I went straight from my Magic Flute rehearsal to “Mozarthaus,” the location where Mozart resided from 1784 to 1787, and was able to see the original score for Magic Flute. When we were not rehearsing or performing, we spent our free time exploring the city! One day when running I stumbled upon Augarten, a public park near where we were staying, which I soon learned was the city’s oldest Baroque park as well as an anti-aircraft defense location during World War II. A bit further from our flat and closer to central Vienna was the massive St. Stephen’s Cathedral, which we visited often, as well as the famous Schönbrunn Palace. However, the festival and our adventures extended beyond the walls of the city. My quartet was requested to perform as part of a weekend concert in Weyer, a small village in central Austria. The village was home to the historic Egererschloss Castle, built in the 16th century, which also happened to be our concert venue. Then, during the last week, we planned an excursion to Salzburg, the town that was the site of the 1965 family film, “The Sound of Music.” We made a point to take the official Sound of Music tour, which featured a festive tour bus that transported us around to the various locations featured in the movie. One notable stop we made was in a neighboring town (Mondsee, Austria) that was home to the iconic yellow church where Maria and the Captain were married in the film. Mezzano is warm and inviting, and the people who live there are as well. And while the caliber of the musical portion of this festival is extremely high, really it is a full, immersive experience– waking up in the morning and running along the river, with the towering Dolomites mountains in the background, seeing the same locals around the main square with my morning espresso, shopping at the same grocery store and knowing the name of the woman at the register, etc. This year, our host home was particularly cute, but the backdrop was the same – majestic as always. Though we were in a picturesque location, the rehearsal schedule for this festival was intense. Not only did the orchestra perform several times, but I was also placed in two operas (Ravel’s L’enfant et les sortileges & Humperdinck’s Hänsel und Gretel) as well as an octet! The venue for our orchestra concerts, the Mezzano town church has a church bell which chimes every hour, on the hour, even into the night. When we were not taking in the sights and sounds of quaint Mezzano (to include milk festivals, donkey races, and more) again we were exploring! My favorite weekend excursion was to Verona, the setting for Shakespeare’s Romeo and Juliet. I visited Juliet’s balcony, as well as the Basilica di San Zeno Maggiore, which rests on the crypt which was the place of the marriage of Romeo and Juliet. Three more weeks (and many more performances) after we returned to Mezzano, it was time to take the return bus to Venice, where I flew straight to John F. Kennedy airport in New York, New York. Looking back on this entire eight-week experience, especially the first half where I did a good deal of travelling alone, I realize just how much I got to know myself. When you’re alone and have to figure out foreign transit, complex interpersonal situations, as well as learn and perform difficult music, you are really forced to become more comfortable with the person that you are at each stage and in every moment. I was a bit unsure at the beginning of this journey, but now on the opposite side of the trip, I firmly believe that I am stronger for it, as a musician and a person. I would encourage anyone who is given the opportunity to travel abroad (as well as learn a bit more about their chosen profession in the process) to just take it! Even if it seems daunting in the beginning stages, at the end of the adventure you will likely be grateful for every little thing you experienced.